I have always been missions-minded, at least in my adult life. When we lived in Bonita, California, we made many trips to Tijuana, Mexico, to minister with Missionary Dave Crum. They were very fruitful trips as many children attended summer VBS, and we were able to help those connected with the church with construction or repair work on their homes. When my husband, Pastor Mike Dengerink, was called to the work in Pittsburg, California, these trips continued, always with tangible results. 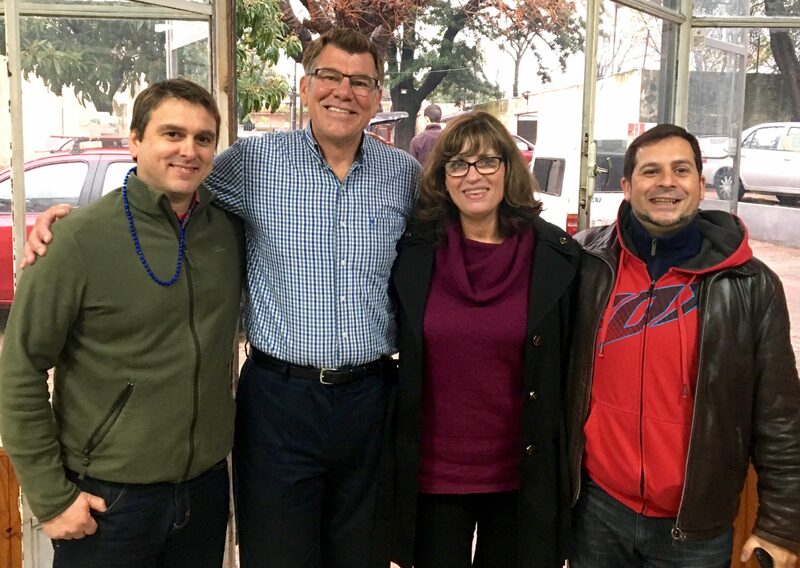 Mike and I have been interested in the work in Montevideo, Uruguay, ever since the Richline family stepped out in faith to leave their home in the Central Valley of California, and begin all that it takes to be a missionary in another country. We wanted to visit, and when Mark’s request for a team to come and help with an English Club was announced at a presbytery meeting, we knew that this was our time! Five of us from Delta Oaks OPC answered God’s call to go! We spent six weeks planning for the English Club and all the details of the trip. I might add that none of us had ever planned an English Club before and so by God’s grace we rose to the challenge and spent many hours planning and preparing. The mission trip to Montevideo was very different from the trips to Tijuana. Montevideo is a cosmopolitan city where atheism abounds. It was winter which, in my opinion, matched the spiritual darkness or apathy of the people toward God. It was really an eye-opener for me to see the hard work our missionaries have to do in this country. The Richlines and their fellow missionaries spent a lot of time advertising and getting the word out about the English Club. I believe they had put out about 8,000 feelers in the way of advertising, but on the first day fewer than eight people came and they arrived about 30 minutes late. The next day we were down by at least half and by the end of the week only two of those had stuck with it. Were we discouraged? No! It was such a blessing to be there and to bring the sunshine of the Gospel to this dark place. Pastor Mike presented a gospel message about Jesus each day and this prompted some wonderful conversations with the two men who stayed the entire week. God is moving in the life of one of the men, Emilio, who said that “he wanted to put Jesus on the throne of his heart!" He has been attending church there ever since we left. Praise the Lord! We've remained in contact with the other man, Alejandro, and continue to pray that the seed planted will take root. He said to us, “We are friends.” I pray that we made not only a friend for this life but a friend for heaven! I was so blessed to be a part of the trip to Montevideo and thankful that God allowed me to be part of a great team that was able to join hands with our missionaries for the furthering of His kingdom. Bringing encouragement and support to these dedicated, Christ-focused missionaries was a true blessing.